It was a rough Monday night for Wilt Chamberlain, even though he's been dead for close to 20 years. On Monday night, James Harden became the second player in NBA history have his own scoring 30-for-30. Chamberlain previously had that distinction to himself. On Monday night, Russell Westbrook became the only player to have a triple-double in 10 consecutive games. Wilt held the previous mark with nine straight games with a triple double. There were a couple of layers to Monday's milestones. First, Harden scored 11 points in a 100-second span in the final few minutes of a game the Rockets were leading by double digits to get to 31 points in a 120-104 win. Westbrook entered the fourth with five assists and got six more in the final 6:54 to get to the triple-double mark. OK, first thought: I am fine with these dudes changing numbers and milestones. That makes the game more fun and the next game more intriguing. Second, would it not be a little hypocritical to be "The guys need to play and not rest" and then not expect them to care about highlights and achievements like these. Finally, in terms of the final score, well, a) NBA teams rally back all the time — ask Spy's Celtics — and, b) we espouse the Spurrier theory on all charges, hints or even inklings of people worrying about someone running up the score. "Don't want Harden to score, stop him." "Don't want Westbrook to get a triple double, guard him." 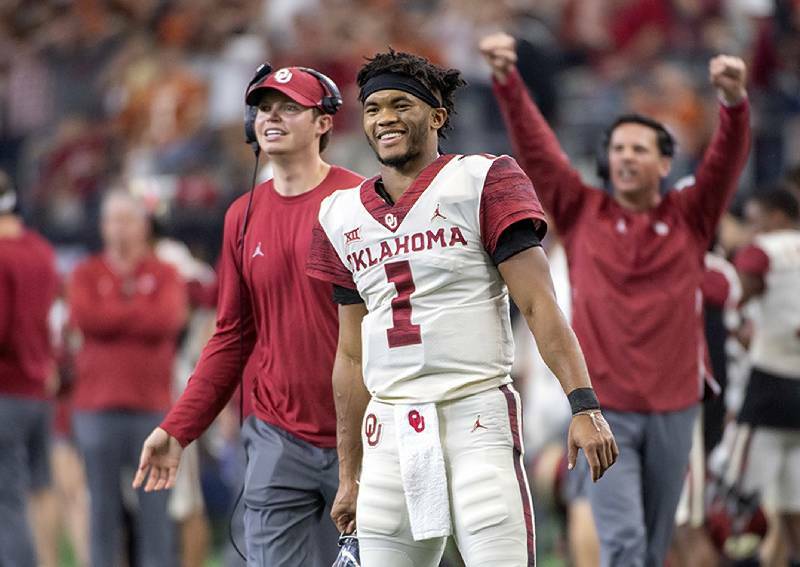 Oklahoma quarterback Kyler Murray celebrates during the Sooners' Big 12 championship game win against Texas on Saturday in Dallas. Yes, we have a dual NFL item too today. Man, this Tuesday has a lot to get to, no? First came the news that Kyler Murray was leaving millions on the table and willing to pay back more than $1 million to the A's of the signing bonus to focus on football and enter the draft. We think it's a great decision — personally and financially — and anyone who thinks he will not be a first-round pick has not been paying attention. Yes, the single most-discussed number from the Underwear Olympics in Indy later this month will be Murray's height, but know this: NFL first-round QB picks are made on potential and desperation, and there are a few teams who are starving and Murray's potential is off-the-charts. Yes, he could bust, but that's the story with every QB, including Baker Mayfield, who went No. 1 overall last year despite not even being a first-rounder this time last year. (Sound familiar undersized, 'system' QB under Lincoln Riley, not a traditional style hmmmmmm.) He could be the No. 1 overall pick the Cardinals and Kliff Kingsbury's system if they deal Josh Rosen, but he would certainly be someone that some team would trade into the back end of round one for, if for no other reason than that extra year of affordable QB play. That was the fun NFL news. 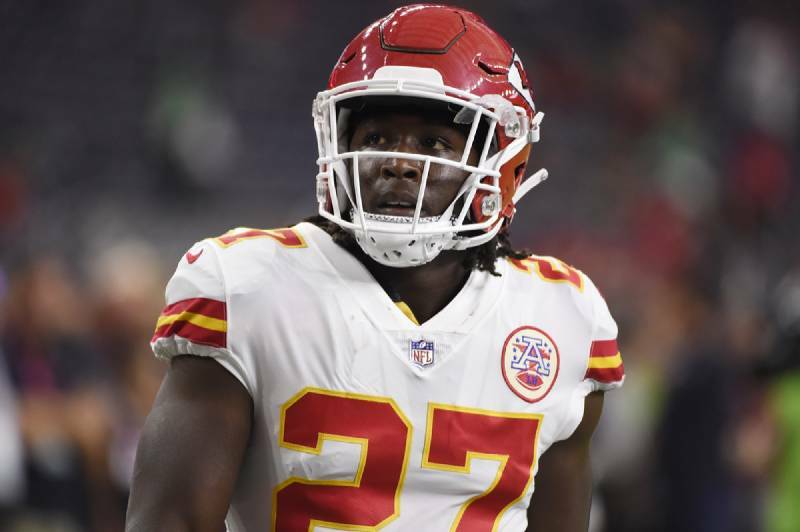 Kansas City Chiefs running back Kareem Hunt was released on Friday. The other NFL news came from the Cleveland Frowns, continuing the awful football leadership decisions from the state of Ohio when it comes to disrespecting and abusing women. Maybe it's something in the water up there, but the Bengals are happy with admitted woman-beater Joe Mixon. Then last summer coach Urban Liar and THE Ohio State Butteyes (not a mistake) were so happy with investigated wife-abuser and all-around scum bucket Zach Smith on staff, he sacrificed his career and his integrity for him. Obviously, being viewed as anti-American is the biggest sin. Ask Colin Kaepernick. Next, wanting to openly discuss concussions is more offensive and viewed as more egregious as beating women. Ask Bob Costas. And don't even get us started on PEDs. Heck, Julian Edelman was presenting a Grammy on Sunday night after missing the first four games of the NFL season for PEDs. Barry Bonds is treated like he has leprosy, and he never failed a test. Never. It makes you wonder about the soul of a multi-billion-dollar operation that takes a much harder stance against someone exercising his first Amendment rights — whether you agree with it or not — and not batting an eye that Kareem Hunt getting a second chance. And before we move on, because as a father and a husband, I feel strongly about this and you should too, we know there are a lot of sad stories in which females have made false allegations. And I understand that folks can make a mistake and want and deserve a second-chance. But we say it all the time, playing a game for millions is a lofty privilege not a God-given right. But in cases like this one — like the Ray Rice one — when there is clear video evidence, the penalties need to be far stiffer and more impactful. — Couple of college hoops nuggets. There was a lot to get to today, gang. First, we will have out college hoops essay tomorrow. Sorry, Chas. Second, our picks from Monday — UNC plus-1.5 and under the 139.5 — went 1-1. So we are 14-8-2. Tonight, we'll ride with Boston College minus-2 over Pitt, Kentucky-LSU under the 149, and Arkansas minus-1 at Missouri. — This morning on ESPN's "Get Up" ever-growing curmudgeonly Kirk Herbstreit went on a rant about how Kyler Murray will flourish said with emphasis, "This is 2018, MAN!" Uh, Herbie. — Georgia coach Tom Crean had, shall we say, an up-and-down Monday. He was forced to apologize for his comments as TFP college hoops maestro Weeds detailed here, although I don't really think he said anything untoward in a college sports world in which I fight for players having the right to move around the same way coaches do and schools 'process' one-year scholarships all the time. And later Crean and Georgia got the highest-rated commit in program history. — Side point about the lack of big-name free agency that really hurts baseball: We are in a time and place that fans enjoy the transaction as much if not more than the regular-season action of their sport. And as Anthony Davis trade rumors and "Where will Le'Veon and AB play" stories give the NBA and NFL year-round bumps in interest, the MLB's lack of activity hurts the profile heading into training camp. — Speaking of that, this directly from Jayson Stark's amazing Twitter feed: Here's a potential lineup and pitching staff for the all-unsigned team: Pitchers & catchers report today - and there's still a tremendous All-Unemployed Team! 1B - Marwin, 2B - Dietrich, SS - Machado, 3B - Moustakas LF - CarGo, CF - Adam Jones, RF - Harper, C - Wieters, DH - Gattis Bench - Harrison, Pennington, Parra, Span, Carlos Gomez, Maldonado; Rotation - Keuchel, Santana, Gio, Fister, Bartolo! Closer - Kimbrel! Setup - Madson, Norris, Clippard, Axford, Ramos, Warren, Moylan, Sipp, Diekman Opener - Romo." That's a team that would contend in every division that is not the AL East gang. — Couple of interesting college football tidbits: Ole Miss is vacating 33 football wins from 2010-2016 for using ineligible players. Also, Wisconsin tackle Joe Dietzen, who made 32 career starts, is retiring from football because of injuries. Stories like that make you remember — when a 22-year-old walks away from potential millions because his body already hurts — how violent that game is. — Great props sheet on Tiger and the Majors: Winning 0 majors is now 2/9, which must be getting most of the action because Vegas has lower that odd significantly since the original posting on 9/24 while all the odds on the others has improved. Winning one major, 15-to-4, winning 2 is 16-to-1, winning 3 is 100-to-1 and winning the Grand Slam is 500-to-1, which is impossibly low. It should be 50,000-to-1 — for everyone. Wow, so much to get to. 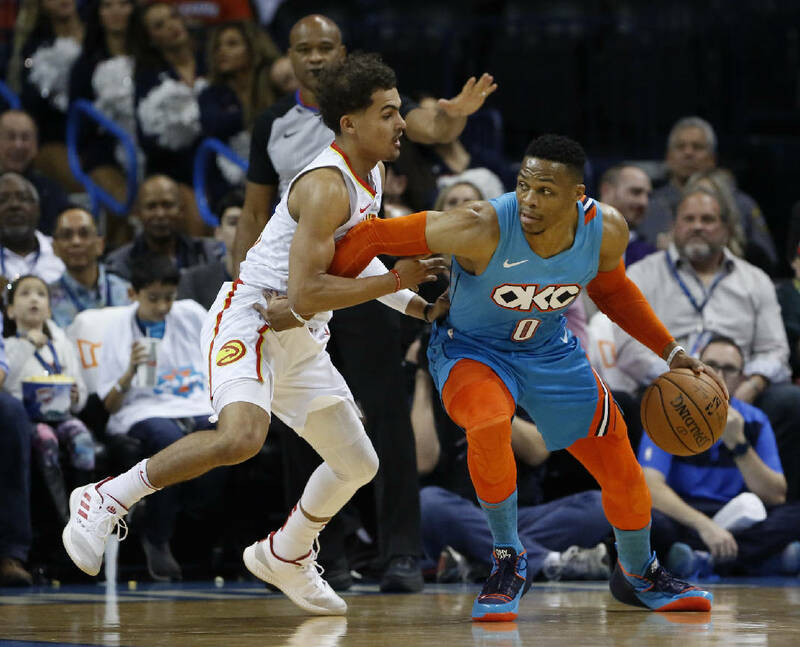 True or false, Westbrook's streak is more impressive than Harden's. True or false, you would draft Kyler Murray in round one. True or false, you would sign Kareem Hunt. True or false, Tom Crean needed to apologize for his comments Saturday. As for today, well, we all know that Honest Abe's birthday is Feb. 12. He and Charles Darwin were born on this day in 1809. Bill Russell is 85 today. It's also Hug Day, International Darwin Day, National Lost Penny Day and Paul Bunyan Day. Let's go back to Abraham Lincoln. Rushmore of presidential nicknames. Go, and enjoy the day.